“First they ignore you, then they laugh at you, then they fight you,” said Mahatma Gandhi. 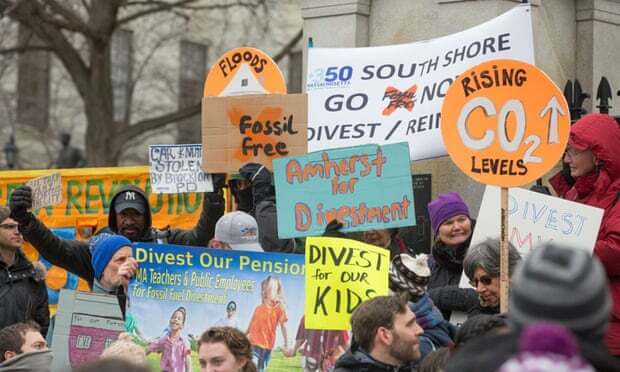 The climate change campaign to divest from fossil fuels seems to be moving through those stages at express speed, with a sudden barrage of attacks from the coal and oil lobbies ahead of its global divestment day on Valentine’s day. The speed is appropriate given that the campaign, which argues the fossil fuel industry is a danger to both the climate and investors’ capital, is the fastest growing divestment campaign yet seen, moving quicker than those against tobacco and apartheid. It’s moving fast in the financial world too, with one finance executive calling it “one of the fastest-moving debates I think I’ve seen in my 30 years in markets”. Let’s take the “laugh at you first”. This unintentionally hilarious cartoon, from a front group for a well-known anti-environmental PR firm, suggests that divestment will kill your “love affair” with fossil fuels, basically leaving you living in a dark cave. The suggestion that divestment is about ending all fossil fuel use tomorrow is a complete fantasy. The actual demand is for investors to stop purchasing new stock and rebalance their portfolios out of fossil fuels over five years. The justification is that there is already three times more fossil fuels ready to be extracted than can be burned, if the pledge by the world’s governments to keep global warming under 2C is to be kept. Yet the fossil fuel industry spent $670bn in 2013 exploring for more coal, oil and gas reserves that will be worthless if climate change is tackled. In a similar vein, but closer to fighting than laughing, is the claim that coal is “the bedrock of modern life” from the American Energy Alliance, a group with links to the fossil fuel industry. About 80% of all coal reserves are going to have to stay in the ground to tackle global warming, so it’s worth noting at this point that the UN’s Intergovernmental Panel on Climate Change, backed by 194 governments, recently concluded that doing so was both affordable and essential to alleviating global poverty. A further attack on the divestment campaign came directly from the oil industry on Wednesday. The new report commissioned by the Independent Petroleum Association of America (IPAA) – ignoring the key investment caveat that the past is an unreliable guide to the future – goes back half a century to conclude that if all US universities divested from fossil fuels, they could lose up to $3.2bn a year. It appears Fischel and Russell have their heads stuck firmly in the oil sands. The overwhelming majority of the economic evidence I have seen shows the exact opposite. Here are some studies, not funded by the oil industry, which indicate recent divestment would, if anything, have had a positive impact on returns and can reduce investment risk: MSCI, Advisor Partners, Impax, Aperio,S&P Capital IQ and BNEF. I have seen one report, from Mercer, that said “divestment is likely to have up-front and recurring costs”. But investors need to look forward. “It is completely wrong to assume the drivers of stock performance in the last 50 years will be same for the next 50 years,” says Ben Caldecott, at the University of Oxford’s Smith School of Enterprise and the Environment. Returning to the modern day, and reality, every nation on the planet has pledged to tackle climate change, meaning the long-term prospects for the fossil fuel industry look uncertain at the very least. But don’t take my word for it, thepresident of the World Bank and the governor of the Bank of England have among others warned of the risk posed to fossil fuel assets by climate change action. The divestment movement does not seek to financially bankrupt the vastly wealthy fossil fuel industry. Instead, the campaign is aiming for moral bankruptcy and is supported by Archbishop Desmond Tutu, who testifies to the power of divestment in helping defeat apartheid in South Africa.